The circle of Willis (also called Willis' Circle, Loop of Willis, cerebral arterial circle, and Willis Polygon) is a circle of arteries at the base of brain that supply blood to the brain and surrounding structures. It is named after Thomas Willis, an English physician. The circle of Willis is formed when the internal carotid artery (ICA) enters the cranial cavity bilaterally and divides into the anterior cerebral artery (ACA) and middle cerebral artery (MCA). The anterior cerebral arteries are then united by an anterior communicating (ACOM) artery. These connections form the anterior half (anterior circulation) of the circle of Willis. Posteriorly, the basilar artery, formed by the left and right vertebral arteries, branches into a left and right posterior cerebral artery (PCA), forming the posterior circulation. 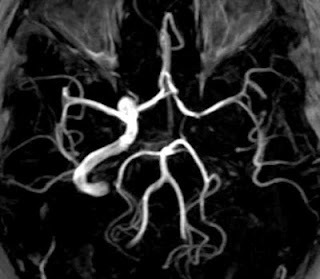 The PCAs complete the circle of Willis by joining the internal carotid system anteriorly via the posterior communicating (PCOM) arteries. The arrangement of the brain's arteries into the Circle of Willis creates collaterals in the cerebral circulation. If one part of the circle becomes blocked or one of the arteries supplying the circle is blocked or narrowed, blood flow from the other blood vessels can preserve the cerebral perfusion. The anterior communicating artery (AcoA) and posterior communicating arteries (PcoA) of the circle of Willis provide the main route for collateral blood flow in cases of carotid artery obstruction. Reference: Collateral Configuration of the Circle of Willis A. W. J. Hoksbergen, MD; B. Fülesdi, MD, PhD; D. A. Legemate, MD, PhD; L. Csiba, MD, PhD. 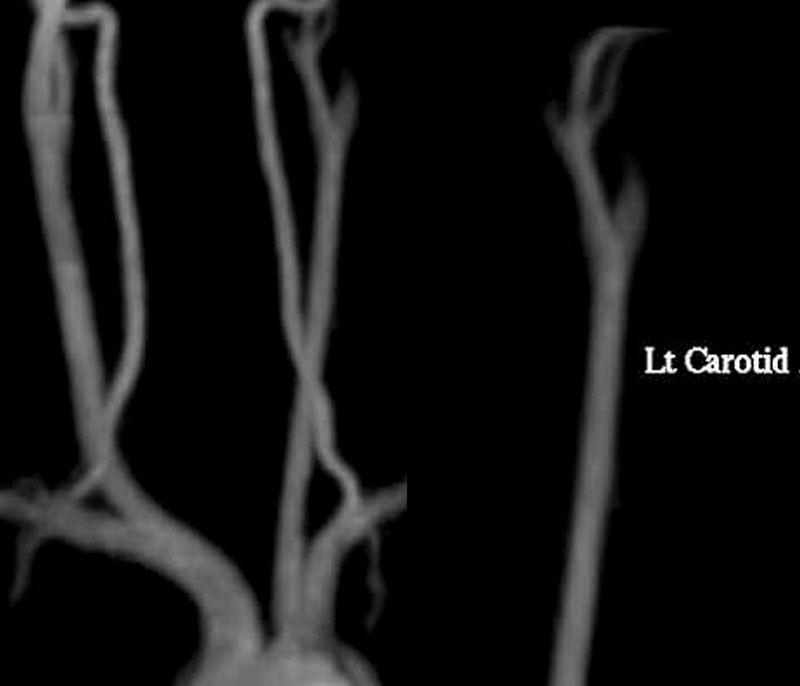 In this case left ICA show severe stenosis / occlusion at its origin, its intra cranial as well as cervical portion not visualised on 3 D TOF non contrast MR Angiography. Left ACA and MCA filled via contra lateral anterior circulation via Acom and posterior circulation via Pcom. Parenchymal sequences show a small left parietal cortical chronic infarct along cortical border zone. Clinical detail of the patient is that he had history of right sided weakness 3months back secondary to this small left parietal infarct along cortical border zone secondary to severe left ICA stenosis but he is now relatively asympatomatic due to efficient collateral circulation of Circle of Willis.